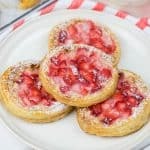 Pastries with Cream Cheese and Strawberries are a quick and easy breakfast idea for your weekend. Only 4 ingredients, puff pastry, cream cheese, strawberries, and strawberry jam, will make your breakfast special. Preheat your oven to 400°F, line a baking sheet with a parchment paper and set aside. In a mixing bowl, cream together cream cheese and strawberry jam. Set aside. Unfold thawed puff pastry sheet. Using a cookie cutter, cut out 6 circles. Using a smaller in diameter cookie cutter or a glass, press the puff pastry in the middle of these circles to make indentions but don’t cut it through. Spread cream cheese mixture inside the small circles and top it with dices strawberries. In a small bowl, whisk an egg and a tablespoon of water. Using a pastry brush, brush the edges of the pastry with egg wash.
Bake at 400°F for about 15 minutes until the edges are puffed and golden/brown color. Take out of the oven and cool them off for about 5 minutes. Dust them with powdered sugar before serving. Enjoy!